Mount Everest is among the most remote and beautiful places in the world. It is also rapidly filling up with massive piles of trash that have earned it the charming nickname "world's highest garbage dump." Now Nepal says it's going to start weighing the trash that climbers come back with, and those who come up light will be charged thousands of dollars. The Nepali government calculated that the average hiker leaves up to 18 pounds of trash behind when they make the trek up the mountain, so that's what hikers will have to weigh in it at when they return to basecamp (whether its all their own or they grab some extra from the path to make up the difference.) If they don't, they'll be charged $4,000. "We are not asking climbers to search and pick up trash left by someone else," said Maddhu Sudan Burlakoti, head of the mountaineering department at the Tourism Ministry. "We just want them to bring back what they took up." 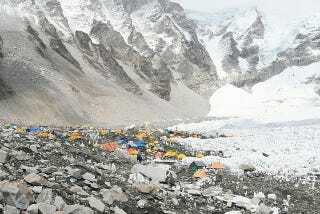 Image: Everest base camp, ilker ende.